What has social media been saying about clinical supervision this week? At the beginning of December 2012 an “online newspaper” was created using a tool called paper.li – the weekly publication is called “The Clinical Supervision Digest“. The aim of the publication is to answer the question, “What has social media been saying about clinical supervision this week?” With that question answered, perhaps we can quickly, easily stay up to date with new information regarding clinical supervision. 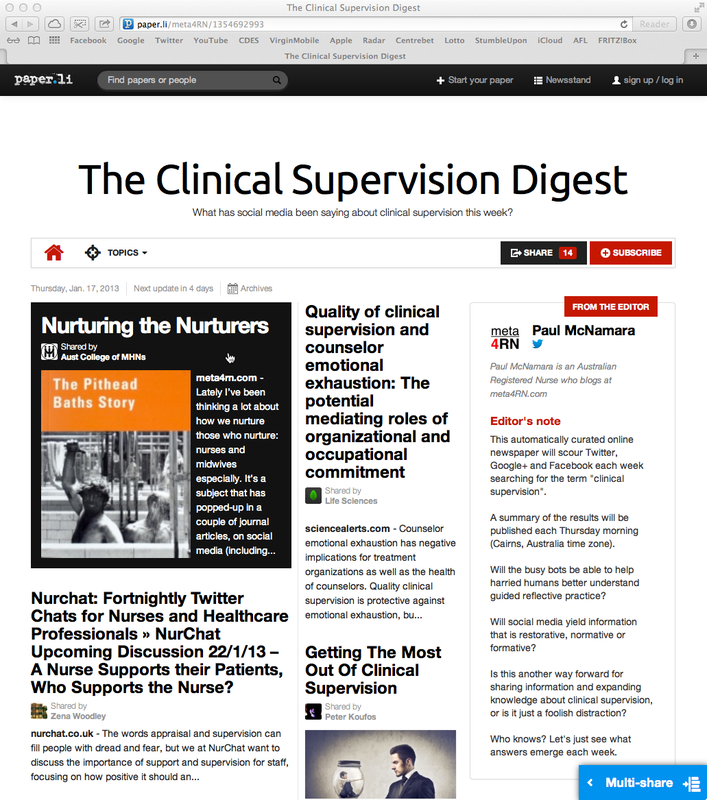 The content of “The Clinical Supervision Digest” is automagically curated by bots that crawl through Twitter, Google+ and Facebook searching for the term “clinical supervision”. A little playfully, but also respectfully, I’ve also added “Brigid Proctor” as a Twitter search term as of 19/01/13. Using the paper.li technology, the search results are collated, formated, and then released every Thursday morning (Cairns, Australia time). This style of publication certainly doesn’t have the same sort of cachet as a peer-reviewed journal or traditional paper-based publication, but it does have some advantages. Along with flushing-out newly released research articles about clinical supervision, it also uncovers opinion pieces, blogs, online conversations, conference news and course information. In this, the information age, we don’t necessarily want to limit ourselves to academic papers alone – social media is a wonderfully effective way to share new findings quickly and broadly. My perception is that the quality of the paper.li searches/the online newspaper has been getting better over the last six weeks. I assume (hope) that we who are using the newspaper are “teaching’ the paper.li bots (aka web crawlers) what we’re interested in. That is, I think (hope) that the bots see which articles we click the most each week, and have been modifying the search and collation functions to give us more of the same. If so, there is a delicious irony that a algorithm in a piece of software can inform and enhance the very human, very interpersonal activity of clinical supervision. I wonder what our ancestors in clinical supervision would make of this; will robot-like web crawlers effectively become another part of the lineage of clinical supervision? Either way, if you’re interested in staying up-to-date with information about clinical supervision, please consider subscribing to The Clinical Supervision Digest via this page. Subscription is free, and if you find the weekly updates useless or intrusive it’s quick and easy to unsubscribe. This post is an obvious companion piece to a previous post: What is social media saying about perinatal and infant mental health this week? Yes, self-plagiarising is alive and well in tropical FNQ. This entry was posted in Blog and tagged #SoMe (Social Media), clinical supervision on 22 January 2013 by Paul McNamara.